Apprising Ministries functions with other soldiers against error in the mission field of online apologetics and discernment along the Internet Front of this Truth War. Sadly, spiritual blindness continues to spread as the Lord sends 1 Peter 4:17 judgments upon the church visible and the new traditions of men within mainstream evangelicalism. 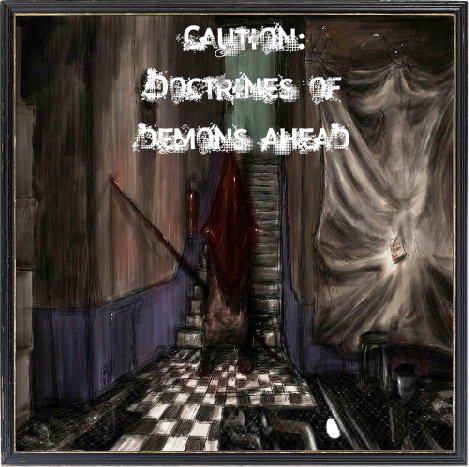 For example, look at recent AM articles like Word Faith Heretic Cindy Trill Receives Award From Billy Graham Evangelistic Association and Supernatural Gatherings In The New Downgrade. Within I’m warning you that one of these judgments is the Lord giving people over to a growing syncretism where fools become convinced God’s “dream” is to draw all Christian factions together. They’re welcome to their sniveling Rodney King philosophy of can’t we all just get along, but they shouldn’t confuse it with the robust historic orthodox Christian faith; it’s light-years apart. In fact, they couldn’t be more wrong; Jesus is actually separating His sheep from false prophets and Satan’s hirelings. I don’t begrudge anyone their opinion either; and that I’m critical of that less than Fab Four matters in the case against Stonecypher’s polluting God’s Word, how? The truth is what Stonecypher’s done is claim he’s in line with the Christian Gospel; he clearly is not, which is why I confronted him now that he’s gaining exposure. As I said before, at least I agree with Peterson this is fertilizer alright. However, for him to even try and equate this man-centered rubbish of Paul Young to the work of John Bunyan gives us even more reason to find Peterson’s spirituality suspect. So right now let’s look quickly at a real Christian review of TS. nowhere in The Shack is the reader given a clear understanding of the gospel. When Mack asks God what Jesus accomplished by dying Mack is told, “Through his death and resurrection, I am now fully reconciled to the world.” When pressed to explain, God says that He is reconciled to “the whole world,” not just the believer (p. 192). Does this mean that all will be saved? Young never goes that far, however he certainly gives that impression when Mack’s father (who was an awful man and showed no signs of being saved) is found in heaven (pp. 214-215), when God says repeatedly He is particularly fond of all people, when God claims that He has forgiven all sins against Him (e.g. 118-119), that He does not “do humiliation, or guilt, or condemnation” (p. 223) and, contrary to large hunks of Scripture, God is not a God of judgment. Dr. James DeYoung, Professor of New Testament Language and Literature at Western Seminary, also did a review of TS entitled Revisiting The Shack and Universal Reconciliation. That longer version doesn’t seem to be available online but it is cited in Dr. James DeYoung Revisiting The Shack & Universal Reconciliation. Seldom does one have the opportunity to review a work of fiction written by a friend that has risen to the top of best seller lists… Who is the author? For more than a dozen years I have known William P. Young. We have discussed much theology in a “think tank.” Over four years ago Paul embraced universal reconciliation and defended it on several occasions. He claimed that universalism changed his life and his theology. This is a form of CU with an option for people to “opt out” of God’s grace; though after some form of purgation time in hell, most—if not all—will opt back in as the love of their mystic mush god with a man-shaped hole in his/her/its heart eventually “wins” them back to Himself. You’ll also see Paul Young discuss it in Transcript of Interview. You need to understand that just like the theory of evoluti0n, it’s nothing but a fairy tale for adults. In closing this, for now, I remind you that many in the Emerging Church are teaching the CU found in TS. Stonecypher gives you a very good look at what Young teaches in TS; in other words, he knows it and CU very well. 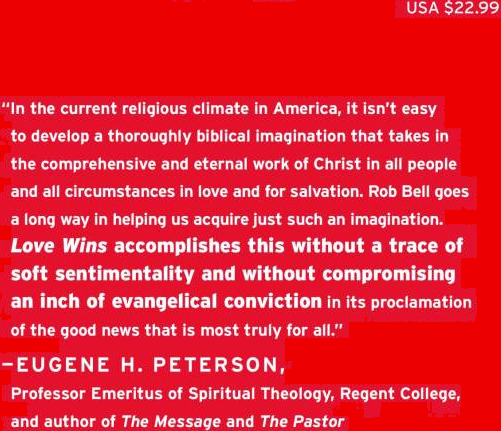 *cough* A lot of hubris, anyone; but with his endorsement of both The Shack and Love Wins I’d say we’re likely getting a good look at where Eugene Peterson himself stands. It really wouldn’t be surprising; some form of universalism is where all adrift upon the sea of Contemplative Spirituality/Mysticism  eventually dock. Back to note 1 — Far from dead, the upgraded Emerging Church 2.0 has been busy forging together its new form of postmodern liberal theology, a Liberalism 2.0 many call Emergence Christianity, which Living Spiritual Teacher and EC guru Brian McLaren begins laying out in his latest book A New Kind of Christianity. Back to note 2 — This neo-Gnostic CSM, a repackaged Roman Catholic mysticism, taught by the dubious duo of Living Spiritual Teacher and Quaker mystic Richard Foster, along with his spiritual twin Dallas Willard, was a core doctrine from the incetion of the Emerging Church circa 1997; it’s often referred to as so-called Spiritual Formation.